Limited to a total of 280 copies on clear green vinyl in plain white paper sleeves with the cat#, artist and title hand written at the top. 10 of these copies came in sleeves signed by label owner Tim Chandler. This is one of those 10 copies. In June 2008, the remaining copies were issued with a new "Emergency Sleeve" and officially made available for sale. 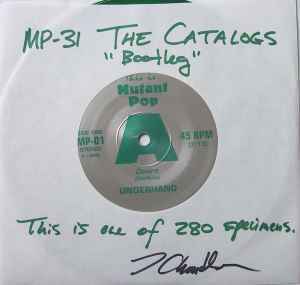 The vinyl was deliberately pressed by Mutant Pop with the incorrect vinyl labels that actually refer to the <a href="http://www.discogs.com/release/1344977">first release</a> on the label. The track titles do not appear on the record anywhere. <i>Etching on A-side runout groove:</i> - DO I HEAR ELVIS? <i>Etching on B-side runout groove:</i> - ISN'T THAT A QUEERS COVER?